Elyse and I haven’t had a bookish adventure in a while, so we decided to take our chances with another one of the Toronto Public Library’s free events. I found an event called Alice’s Adventures in Wonderland Decoded, which sounded interesting, so we made our way out to Etobicoke with high hopes. 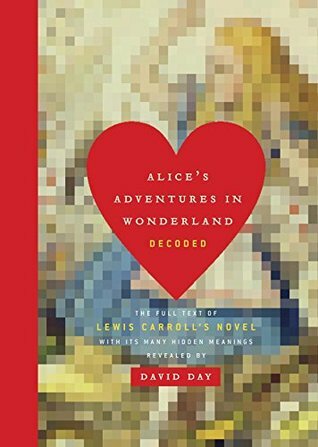 Author, David Day reveals the fairy tale of Alice’s Adventures in Wonderland as a Memory Palace: a multi-layered construct of philosophy, history, mathematics, classical myth and spiritualism. Furthermore, all of the creatures in Wonderland have real-life identities, and proves to be a veritable “Who’s Who” of Victorian Britain. In fact, Wonderland is a complete classical education disguised as a fairy tale — Carroll’s gift to his “wonder child” the real-life Alice Liddell. It was delivered in coded form because in that age, it was a gift a girl would be unlikely to receive in any other way. We had a nice meal at Jack Astor’s before making our way to the library. We learned our lesson at the last one of these events. Always eat first or you will be too hungry to listen to the author. It’s definitely good that we ate first, because the author was rather monotone and it would have been entirely impossible to concentrate. We were a few minutes late getting there because of some confusion with directions (a classic Elyse and Amanda move) so the event had already started, but a kind librarian let us in. The audience was watching a short film about the book, so we snuck in and got a couple seats before the real talking started. The film has a lot of interesting bits of information about decoding Alice, so check it out below if you are curious. The unfortunate part of the night was that no one was directing the flow of the event. With only an hour, and a 10 minute video at the beginning, there should have had about 20-30 minutes of speaking material, then 10-15 minutes of questions (with simple answers) and then a short meet & greet for signing copies of the book. Respecting the audience’s time is incredibly important, and although some people are willing and able to stay longer, most people plan for the exact timing of the event. I think the author missed out on really connecting with his readers in this case. We didn’t really learn a lot about decoding Alice, but we definitely came away interested in the topic. We both want to learn more about the Liddell family and their relationship with Lewis Carroll. It was the seedier bits of the Alice story that really peaked our interest. I’ll definitely have to read more about it when I have time. Day’s book is available at Chapters/Coles/Indigo, so I’ll have to read more when I have some time. Are you envious of our bookish adventures around Toronto? We usually find events through the Toronto Public Library website. Check out some upcoming events HERE.